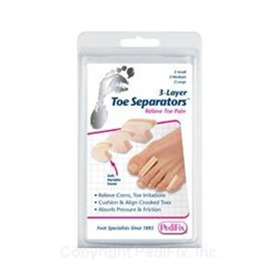 Separators3-Layer Toe Separators™ relieve pain, soothe between-toe irritations, cushion and protect sore spots. They gently separate and align problem toes and make shoes more comfortable. Washable, durable multi-layer foam design makes them effective for weeks. Stay in place without adhesives. 6 per pack (Mix pack contains 2 S, 2 M, 2 L).